12"/52 (30.5 cm) Turret on an unidentified Russian Battleship. 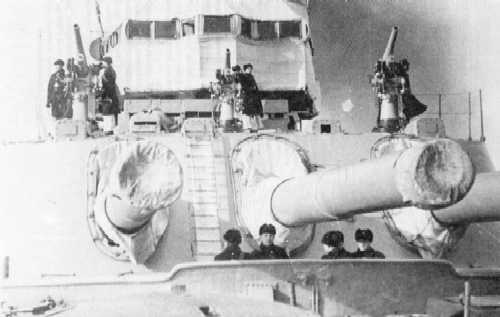 These were the most powerful guns ever used on a completed Russian or Soviet warship. They were built to a Russian design and many were also used as coastal artillery and railway guns. The design of the gun began in 1906 at the Obukhov factory and a prototype was completed in 1907. The Navy initially ordered twenty guns from Obukhov at the end of 1907, with 178 more being ordered in the following years. 126 of these were delivered prior to 1917 (some sources say 144 guns). In 1917-18 an additional 42 guns were delivered, but after that point the Russian Civil War halted production until 1921 when 14 more guns were finished. In 1922 there were 29 guns at the factory at different stages of completion, some of which were subsequently finished. In 1939-40 some guns were converted into a loose liner type. The battleship turret was designed by the Metal Factory in 1909 and was based on the modernized mountings for the 12"/40 (30.5 cm) gun used on the Andrey Pervozvanny class battleships. The battleships armed with these guns were known for their excellent shooting during World War I. During her engagement with the German/Turkish battlecruiser Goeben/Yavuz on 8 January 1916, Imperatritsa Maria, firing into the sun at a range of about 20,000 meters, landed her first three salvos at 500, 100 and 50 meters short of the Turkish ship. As this distance was outside of her range, Yavuz was forced to run for home, pursued by the Russian dreadnought. Yavuz's commander, Captain Richard Ackermann, later reported that "Imperatritsa Maria can run and shoot." On 4 April 1916, Imperatritsa Maria's sister-ship Ekaterina II straddled and then knocked the stem off the German/Turkish light cruiser Breslau/Midilli at about 21,000 meters. The guns on the battleship Imperator Alexandr III served under several flags. Imperator Alexandr III was taken over by the Soviets and renamed Volya ("Freedom") on 29 April 1917. In May 1918 she was captured by the Germans at Sevastopol and commissioned in the German Navy on 15 October 1918. After the German surrender, the ship was taken over by the British who subsequently moved her to Izmir, Turkey. On 17th October 1919, she came under White Russian control and renamed General Alekseyev. With the defeat of the White Russians, she was interned by the French at Bizerta, Tunis. After the Soviets refused the French offer to return her to their control in 1924, she was subsequently scrapped at Bizerta during the 1930s and her guns then used in coastal batteries to defend that port. In the early part of World War II, France decided to transfer the 12 guns to Finland and Norway and three cargo ships were dispatched from Tunis to those nations. The two ships bound for Finland arrived safely and their eight guns were used for coastal batteries and railroad guns. But the Norwegian steamship Nina with her cargo of four guns was captured by the Germans in 1940 during the fighting in Norway. The Germans moved these guns back south and installed them as part of their Atlantic Wall defenses at Le Frie Baton, Guernsey Island, where they were known as Battery Nina (later renamed Battery Mirus after Kapitän zur See Rolf Mirus, killed in November 1941 near Guernsey Island). This battery was active between late 1942 and 1945 and survived the war, with the guns being scrapped sometime later. These guns appeared to have been modified to use standard German 30.5 cm (12") projectiles and propellants. One of the sources below reports that these guns were derated after reliability problems with these projectiles, but this may be a confusion between the much longer range for the "lightweight" Spr.gr. L/3,6 Bdz u. Kz (mhb) of about 56,000 yards (51 km) when compared to that for the "normal weight" Psgr. L/4,9 (mhb) of about 43,000 yards (39 km). In addition to the Naval version of the gun, there was also a Coast Defense version which differed in having a larger chamber volume and used different ammunition, although it could also fire the naval rounds. By 1927 all of the coast defense guns had been changed over to using only naval ammunition. These were mainly mounted in twin coastal defense turrets that were designed in 1913. A total of 14 of these coastal defense turrets were built. Single open mountings were also produced for the coastal defense fortresses. There were four four-gun batteries around the Baltic, two four-gun batteries around the Black Sea and two five-gun batteries in the Far East. After the battleship Poltava was damaged by fire in 1924, her turrets were removed and then installed as coast defense batteries, two near Vladivostok in the 1930s and two near Sevastopol in the 1950s. Both batteries were in active service until 1996 and the turrets still survive. Nomenclature note: This weapon is usually referred to as "Model 1910-1914" in western sources. Constructed of A tube, two B tubes to the muzzle, two C tubes, two D tubes and jacket. The breech bush screwed into the jacket, locking the parts together, and a collar was shrunk on the breech bush and the end of the collar covered by a small ring with a shoulder. Both collar and ring were placed in position when hot. A Welin breech block was used. 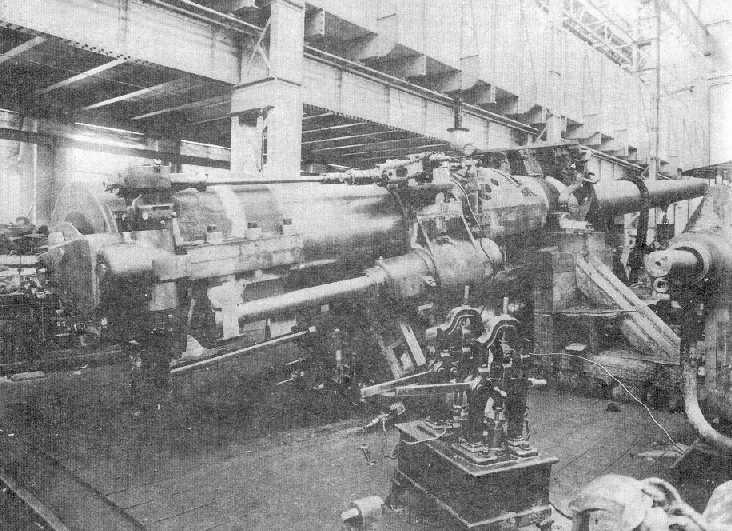 The actual bore diameter was 304.8 mm (12.0"). 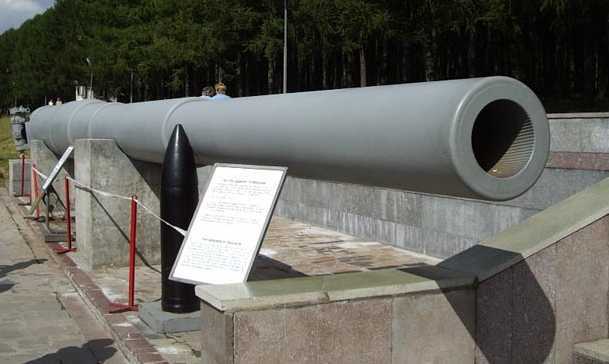 ^Guns captured by the Germans during World War II were modified to take German projectiles and charges. These modified guns had a chamber volume of 13,669 in3 (224.0 dm3). Naval shells are believed to have been 4crh. ^The Chemical round was rebuilt from APC and training rounds. ^The super-heavy round was not accepted into production due to the low muzzle velocity which gave disappointing range and penetration performance. 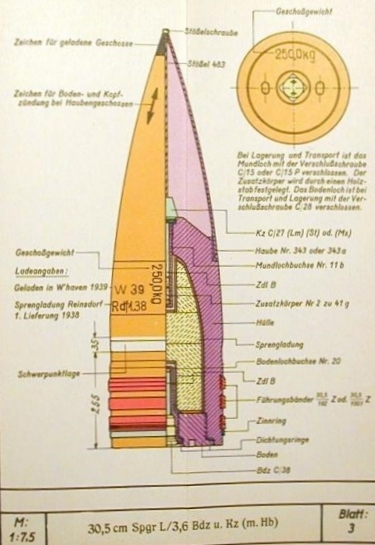 Between the end of 1918 and the beginning of 1919 the British tested the Russian projectiles against 8" (20.3 cm) Cemented (face-hardened) armor at 20 degrees to the normal, this being the condition used to test the British 12" (30.5 cm) Mark VIIa (Greenboy) projectiles. The projectile holed the plate but broke up at 1,447 fps (441 mps) and penetrated intact at 1,615 fps (493 mps). British post-Jutland tests of Russian 12" M1909 APC [M1911 APC - TD] shells gave excellent results at 20 degrees obliquity, much better than the new Greenboy British 12" Mk VII APC shell did and seemingly on a par with the larger British 13.5" APC shells. ^1.11.21.3Guns in triple turrets were individually sleeved. ^The battleship mountings are unusual in that they were all on the centerline at the same deck level. ^"Naval Weapons of World War Two" says that the Russian battleship mountings were designed by Coventry Ordnance Works (UK). ^Mountings at Sevastopol were modified in 1940 to increase elevation. ^5.15.2Training and elevation were electrically powered with hydraulic drive gear. 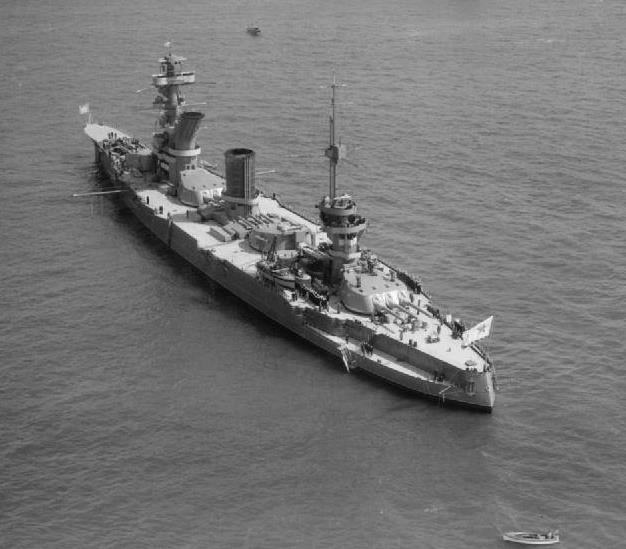 Marat at the Spithead Review in 1937. Note how all turrets are at the same level. Bow 305 mm/52 (12") turret on Battleship Marat in 1925. Photograph from "Last Giants of the Russian Imperial Fleet". 305 mm/52 (12") on test stand. Notice that the recoil cylinders are not pressurized, allowing the gun to go to the full recoil position. 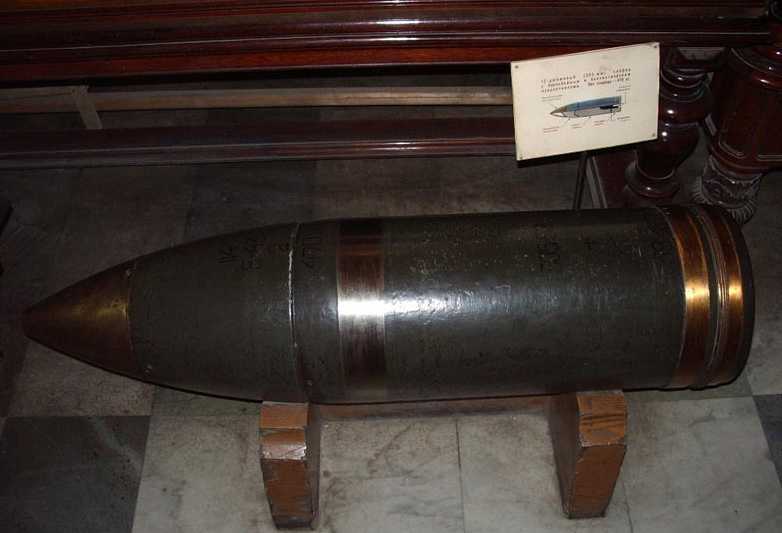 305 mm/52 (12") now at Central Naval Museum, St. Petersburg, Russia. Photograph copyrighted by Vladimir Yakubov. 305 mm/52 (12") APC now at Central Naval Museum, St. Petersburg, Russia. Photograph copyrighted by Vladimir Yakubov. 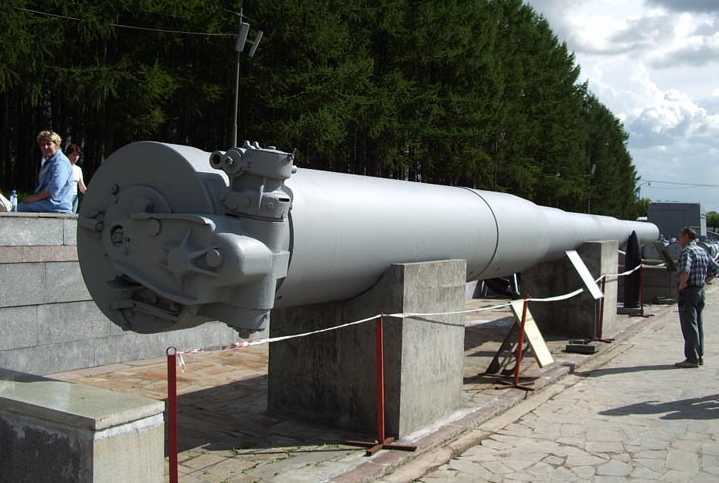 305 mm/52 (12") HE now at Central Naval Museum, St. Petersburg, Russia. Photograph copyrighted by Vladimir Yakubov. Kilta Website. Includes a good many pictures of Kuivasaaren Fort, located near Helsinki in Finland. The 305 mm/52 (12") twin coastal defense mounting at this fort has been restored to a near-operational status and has fired water blanks several times since 1992.